CSIRO research into the Melbourne to Brisbane Inland Rail project has determined that shifting horticulture and processed agriculture from road to rail could reduce transport costs for the agricultural industry by an estimated $70 million per year. Australia’s national science agency conducted a pilot study in 2018 using its computer logistics tool TraNSIT (Transport Network Strategic Investment Tool), along with extensive industry engagement, to focus on Parkes to Narromine in Central West NSW. 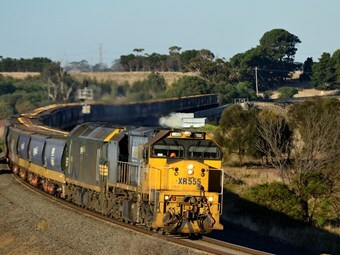 Researchers identified a baseline of existing freight movements in this area to estimate the potential transport cost savings for the entire Inland Rail project, marking the first time such a detailed analysis on road to rail supply chains in Australia has been completed. The focus included horticulture, and processed agriculture, such as meat, rice and dairy products. The analysis showed if existing agricultural road trips were shifted to Inland Rail, the agricultural industry could save between $64 to $94 per tonne (depending on back-loading). This equates to about $70 million in reduced transport costs per year based on the shift of 923,000 tonnes of horticultural and processed agriculture to the lower cost transport option that Inland Rail provides. Additional analysis revealed that if existing coastal rail trips shifted to inland rail, this would result in an estimated saving of $28 to $35 per tonne. "Our research has shown that Inland Rail would bring an improvement in rail travel time and transport cost, particularly important when considering perishable products," CSIRO TraNSIT leader Andrew Higgins says. "This would make it a lot more competitive with the travel time advantages of road transport. Parkes to Narromine was chosen for the case study as it is the first section of track to undergo construction. There’s also a large number of supply chains in this pilot area involving hundreds of stakeholders. "A big cost in food production is transport, particularly given the large distribution of where and when it is grown across Australia, and the long distances to major domestic markets, often over 1,000 kilometres," Higgins says. "These type of savings with Inland Rail would mean food companies would have lower cost access to markets further away than they supplied to in the past. "The benefit is for those selling to market, basically large farming corporations, food companies and those behind processing facilities. "You’d expect the savings would then be passed back onto farmers." TraNSIT will also be applied to the broader Inland Rail corridor (commencing with the southern corridor from Narromine to Seymour) to obtain more detailed cost savings across a broader range of commodities. New commodities will include grains, cotton, livestock, wool, minerals and general freight. The TraNSIT computer modelling tool works by analysing every possible combination of transport routes and modes (road and rail) and determining those that optimise vehicle movements between enterprises in the agriculture supply chain.